Moist crisp skinned Beer Can Chicken, smoky bud braised pork ribs, an outstanding combo for this amazing BBQ summer we are experiencing, now come on, who’s still BBQing only sausages and burgers, come on over here have a look at this little lot and have a go for yourself, you only need a BBQ with a lid with enough room for the beer can chicken to be sat upright. I used a dry BBQ rub, I’ve posted my recipe on here frequently or use a good commercial rub on both the thick cut pork ribs, I ask for a layer of belly to be left on mine, and chicken, leave both for a few hours to soak up the flavour of the rub. I then lit the BBQ for low indirect smoking, you can do this with the coals to one side, or on a dedicated BBQ/smoker such as this Kamado Joe, and tossed on some apple and pecan wood to smoke. Start the ribs off cooking at 110-120 deg C for 4 hours with the lid down. Then wrap in foil and pour in half a large can of bud, usually I’d say drink the other half, but in this case it will be a majestic throne for your bird. Pop the ribs on and cook for a half an hour. 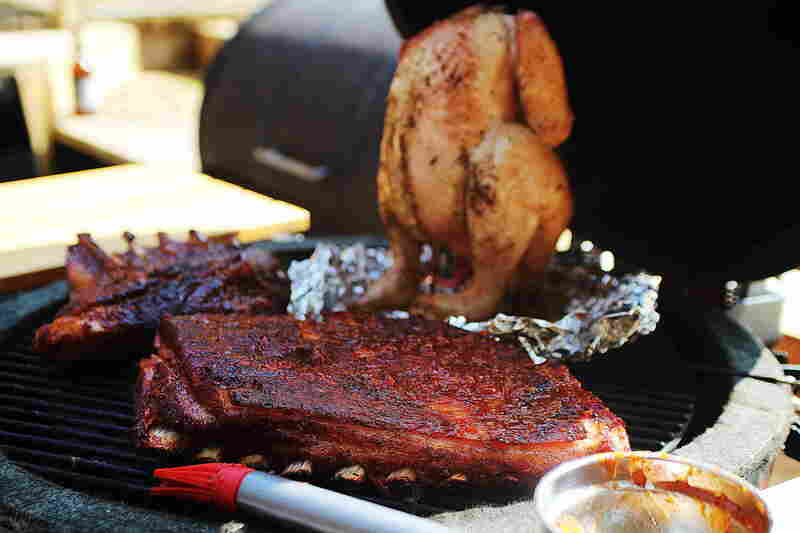 At this point mount the chicken on the half empty beer can and place upright in the smoker, and replace the lid. After half an hour remove the ribs from the foil, and smother with your BBQ sauce of choice before returning to the BBQ. Increase the heat to 140-150degC for an hour. The chicken should be cooked through and crisp skinned, and the ribs should be tender and moist but with a lovely smoky bark. Enjoyed with slaw, homemade bread and a cold Bud. As an alternative to the Dirty style of cooking I’ve been using a lot recently, this style of cooking doesn’t really benefit most fish, but plank roasting, and in this case Birch Log Roasting, works extremely well, protecting the fish from the direct heat but roasting and smoking it to perfection. 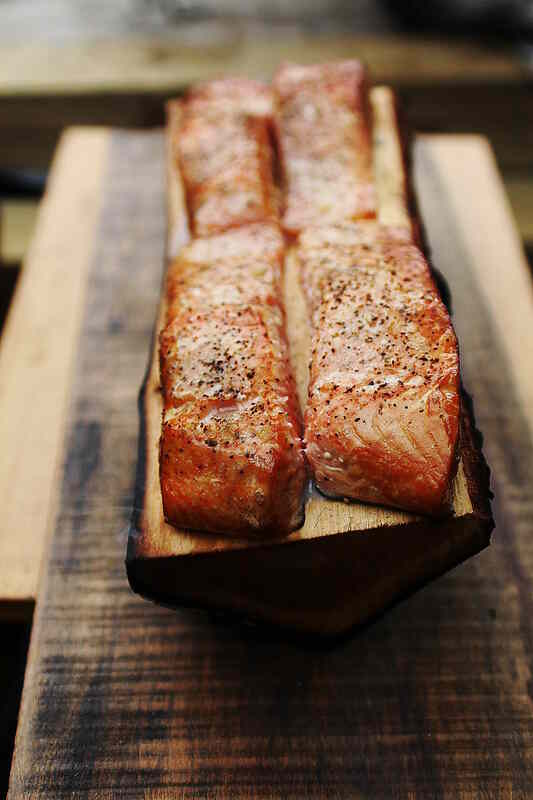 I used a little sea salt and a pinch of BBQ seasoning, on the salmon fillets and placed them on a birch log that I’d rubbed with a little olive oil on the top to stop the fish sticking. I nestled the log in the coals on a medium hot BBQ, I used a Kamado Joe from Outdoor Gourmet which is ideal for this kind of cooking. With the lid closed the sweet birch smoke was able to penetrate the fish and cook it perfectly, it took about 10-12 minutes. The bottom of the log will char up and smoke, make sure you have some heavy duty oven gloves or tongs for removing the log. I served the salmon with a flower salad, and some herby couscous. A couple of posts ago, I eluded to some good news, well i’m really chuffed to announce my first book, available to those of you with an iPad initially at Smoky & The Wood Pit, for the princely sum of £1.99 you will have access to 20 of my recipes, some popular classics, and some new and exciting and only available there. I’d love to hear what you think, and whether you try any recipes. This post has long been remiss, back in the now feeling long distant summer, I was given some intriguing wood paper to cook food in from the lovely people at The Roasting Plank Company to have a play with and see what I came up with, I really wanted to do something special with the beech wood paper, and until now the recipe had eluded me, but Christmas is a time for presents…isn’t it?? So after soaking the wood paper for a couple of hours, I made up a couple of lovely parcels using a turkey breast escalope, a slice of bury black pudding crumbled into the middle and a tablespoon of cranberry sauce to sweeten things up. I then rolled the escalope up and wrapped with smoked streaky bacon, before wrapping in the wood paper and securing with a bow using butchers string. Cook on a medium hot BBQ indirectly for 20-30 mintutes with the lid on. Or if it’s abit cold then place on a hot griddle for 5 minutes each side, to start the wood smoking a little, and then pop into a preheated oven to 200degC for 15-20 minutes until cooked through and the bacon becomes crisp. The turkey stays lovely and moist, and picks up a lovely sweet smoky taste from the wood paper. You could vary this recipe, with chicken breast, blue cheese, bbq sauce, fish or vegetables, the choice is yours, there’s lots of great ideas on the roasting plank companies site.